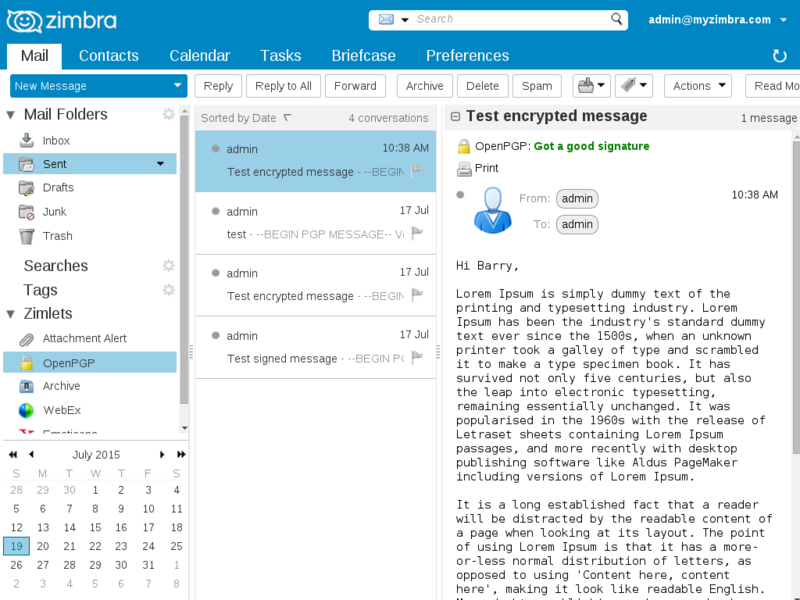 Zimbra OpenPGP Zimlet works on Zimbra 8.7.11 and above, tested on Zimbra 8.8. Older versions of Zimbra are not supported by this Zimlet. Please report issues via Github: https://github.com/Zimbra-Community/pgp-zimlet/issues Thanks! Despite I think Barry is an awesome Guy and Developer, the zimlet is great ! Do it like me and use this zimlet, have fun using it AND donate if you appreciate it ! 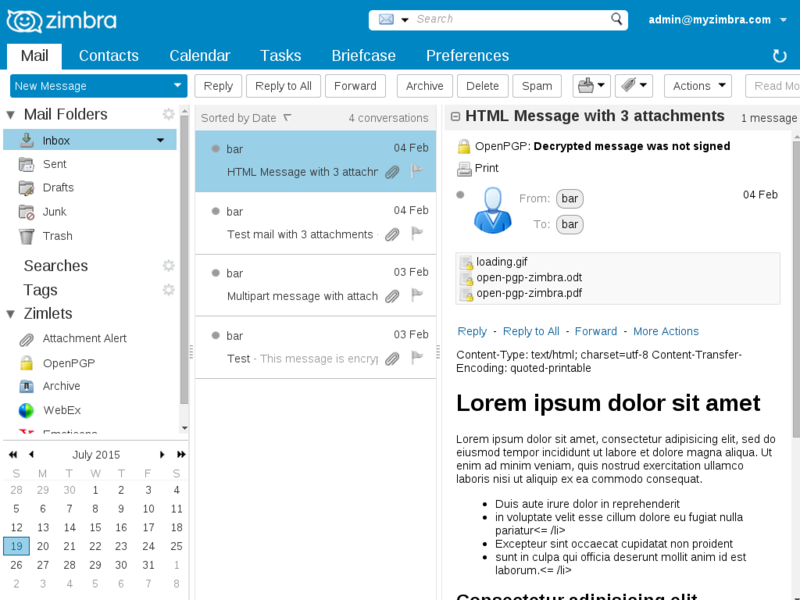 One of the most useful Zimlet, a must for Zimbra itself. Thanks Barry for your continuous work. I have been using this zimlet for awhile now, I am pleased with the zimlet and its progress. The dev is quick to respond and is constantly improving the zimlet and adding new features.We use this for financial and client info and the dev has made it easy for non techies to use PGP. The biggest issue we have had in the past is that PGP/encryption was to hard for some users and the security would break down if they couldn't figure out how to easily encrypt/decrypt messages. This Zimlet has helped that greatly. This is one of the most useful zimlets. 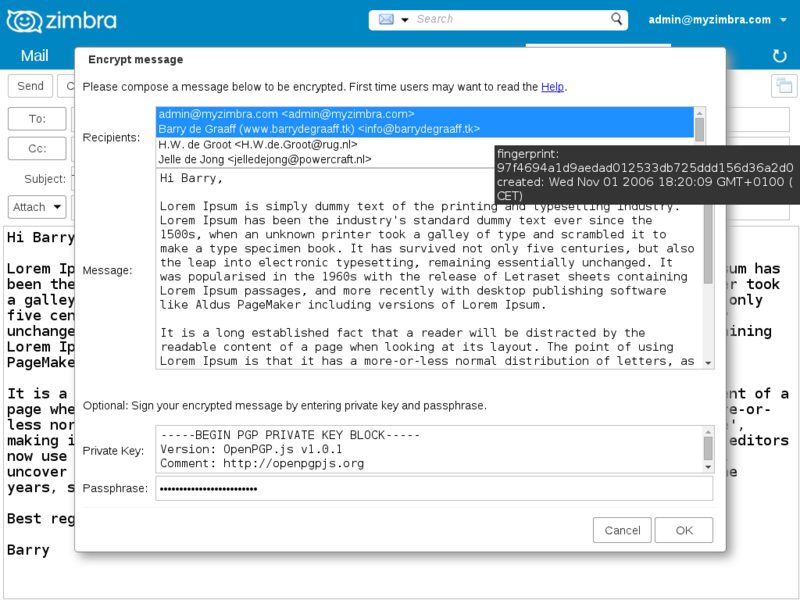 I have used OpenPGP for years and I could not use Zimbra Webmail anytime (I had to switch to Thunderbird for all encryption/signing messages).It is more useful for Zimbra community because of its open source license. 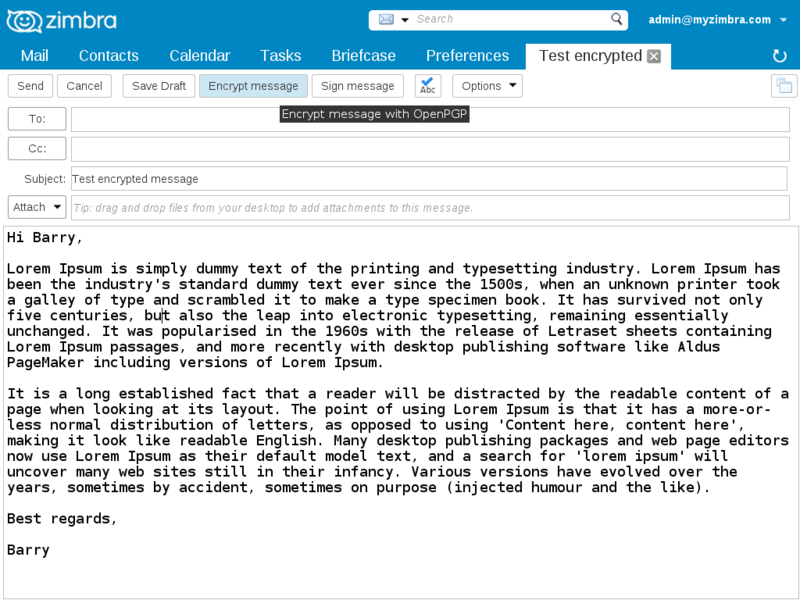 It keeps Zimbra as the best open source messaging ever.Thanks Barry for your efforts. 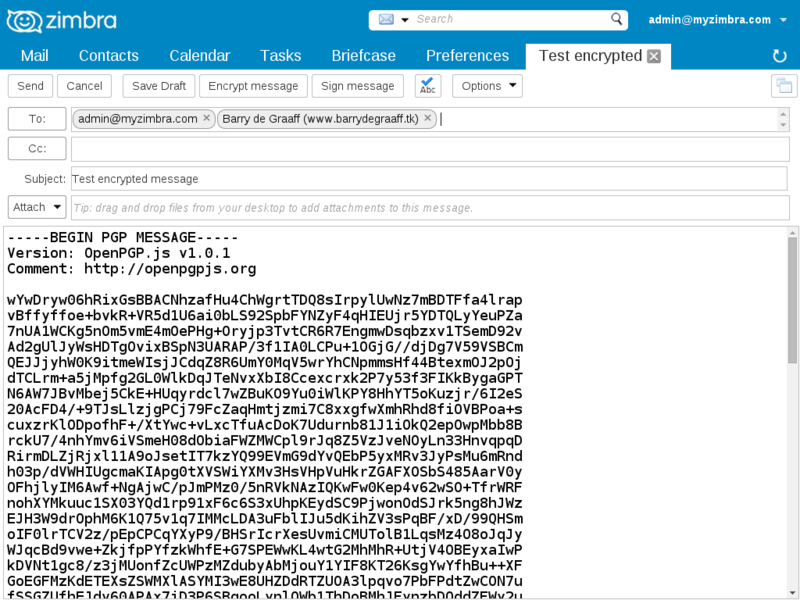 Zimbra OpenPGP Zimlet works on Zimbra 8.5 and above, tested on Zimbra 8.6. AS OF VERSION 1.8.3 - RECOMMENDED INSTALL METHOD USING GIT - We no longer provide ZIP files for zmzimletctl (see the README.md).